QUOTE OF THE DAY – Something will grow from all you are going through. And it will be YOU! By Curiano. TERRAL CITY WIDE GARAGE SALE – Our annual City Wide Garage Sale is scheduled for November 2 & 3. If you would like to be put on the list please call Shirley at 437-2337 and have your address put on the map. Maps will be at the local businesses and the post office on Thursday Evening. FIRST BAPTIST CHURCH KIDS FOR CHRIST – On October 31st, we will not have our RA’s, GA’s and Kids for Christ. Kids will be busy spending time with family and Trick or Treating. We will resume our regular schedule on November 7th. 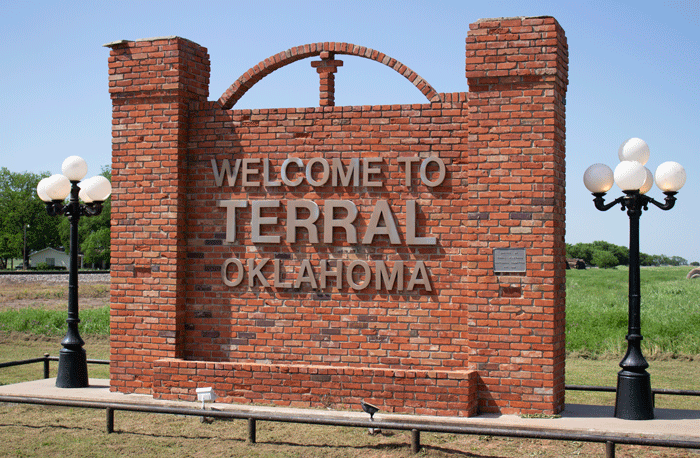 PUBLIC NOTICE – The Town of Terral City Council meeting will be moved forward to November 13th due to November 12th being celebrated for Veterans’ Day. Terral City Council Meeting will be at the City Hall on Tuesday, November 13th at 6:00 p.m.
BINGO NIGHT – The First Baptist Church Girls in Action will be having their Annual Bingo Night on Saturday, November 10th, 2018 at the Terral Community Center. Admission will begin at 5:30 p.m. and Bingo will begin at 6:00 p.m. A Snack bar will be provided and a bake sale. All proceeds go to the activities, crafts, and outings for the GA Group. Come out have a good time and support our kids. Each game is $1.00 or a cover of $25.00 for the night for 30 Games. All prizes are valued at $30.00. It is a great way to start your Christmas shopping. CRAFT SHOW & BINGO – The FBC Girls in Action will be holding a Craft Show and Bingo on Saturday, December 1, 2018, at the Terral Community Center. The Craft Show will be from 9:00 to 2:00 p.m. Come on out and select some unique gifts for Christmas. Gift wrapping will be available. Bingo will start at 3:00 p.m. Tables will reserve for $10.00 each. If you would like to reserve a table call Shirley at 437-2337 or 437-2545 after 5:00 p.m. All proceeds go to the FBC Girls in Action for activities, crafts, and outings for the group. Hope to see ya there! IT’S-A GIRL – Tatum Nicole Walker made her appearance on October 15, 2018, at 9:05 p.m. She weighed in at 9 pounds and 9 ounces and was 21 1/2 inches long. Proud parents are Courtney Cook and Jim Walker. Proud Grandparents are Jason and Mary Esther Cook of Saint Jo, Texas. Proud Great Grandparents are Santos and Yolanda Castillo. Congrats to the whole family. Bryant, Archie Fulton, Scotty Day, Tom Baysinger, Sue Linton, Martin Villarreal, Sr., Joe Martin, Adam White, Mary Loo Duke, Esther Grimes, Virginia Tanner, Darlene Hall, T.K. Delaney, Manuel Villarreal, Shawna Reed, Hardy Johnson and our military stationed around the world. May God Keep you in His loving care.